The vision expanded with the realization that the park would attract people to the area and that would ignite investment into the downtown area. But to get from the park to downtown people needed a safe connection … a safer, more pedestrian friendly Mississippi Drive. The City set to work on the improvements to the streets and other infrastructure. Eventually, when the private sector began investing in the downtown area, the infrastructure was there to support the improvements. The work on street improvements continues today with Mississippi Drive and will continue with a redesigned Carver Corner and reconstruction of the southern entrance to the City, the Grandview Avenue corridor. 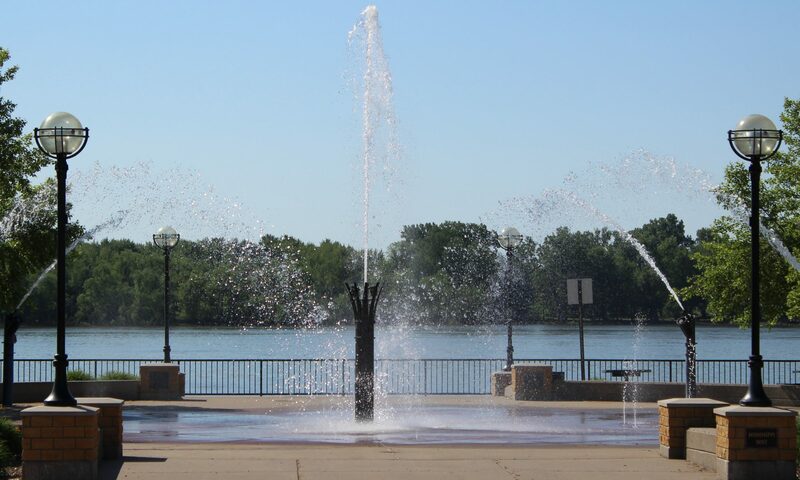 The vision of a connected Riverside Park-Mississippi Drive-Downtown Muscatine was created and enhanced since the 1980s with public and private input along with public and private funding. The development of Riverside Park with free parking (542 spaces), plenty of green space for people to enjoy, and other amenities was the initial project. For several reasons that free parking was not being utilized including people having to walk to the downtown area for work, shopping, or dining, and for the many safety concerns to pedestrians as they attempted to cross Mississippi Drive. There was also no real safe way to get between the two areas because of the railroad corridor and the wide street that consisted of four lanes with little medians, on-street parking, and a driving public that was more concerned with getting from point A to point B as quickly as possible. “You might as well put on your track shoes and race across the street before the light changed,” Boka said. Most of the traffic lights on Mississippi Drive are gone now with just Iowa Avenue and Cedar Street remaining. That meant the motor public must be more willing to yield to pedestrian safety. Safety was just one of the concerns addressed in the reconstruction of Mississippi Drive. Developing a corridor that would enhance the connection between the Mississippi River and the Muscatine central business district was important to the planners as was creating a roadway better able to remain open during occurrences of flooding. In the early 1980s Mississippi Drive (named Front Street until the mid- to late-1970s) and Grandview Avenue were the main traffic route into and through Muscatine as U.S. 61 and Iowa 92. That changed when the bypass opened in 1985 taking U.S. 61 and most of the through traffic with it. The road along the river was designated as Business 61 but Iowa 92 was not removed from the Grandview Avenue/Mississippi Drive corridor and put onto the bypass until the fall of 2014. The character and volume of traffic using the Grandview Avenue/Mississippi Drive corridor changed after the opening of the bypass according to the “Corridor Alignment and Geometric Alternative Analysis” performed by Stanley Consultants, Inc., as part of the Phase 1 Environmental Assessment and Preliminary Design for the City of Muscatine that was released in February 2012. Instead of a through route, the corridor became a destination route for residents and business traffic in the city. In 2014 the city successfully negotiated with the State of Iowa for a transfer of jurisdiction that effectively ended the Business 61 and state highway designations, turning the corridor into a city street. The transfer of jurisdiction came with some cash ($13 million to the city) but it also came with an obligation to complete a number of elements that were placed in the project by the federal government. Not only was the corridor traffic changing but so was the riverfront and downtown Muscatine. Early efforts to enhance the downtown area focused on the creation of a park and recreational facilities along the riverfront. Approximately $19 million has been spent in public and private funds since 1983 transforming the riverfront into a destination. More enhancements are slated for Riverside Park in the coming years according to the updated master plan recently adopted by the Muscatine City Council. Whether it was the need to reconstruct Mississippi Drive that led to the renaissance of the riverfront, downtown, and 2nd Street, or if it was one versus another, the key was that steps were taken with some prior effort to have everybody working together and on the same page. Boka retired in 2014 after 37 years of service to the City of Muscatine most recently as the Director of Community Development. He was instrumental in the development of Riverside Park and has played a key role in the planning of Mississippi Drive, Carver Corner, and Grandview Avenue updates. The connector between the riverfront and downtown, Mississippi Drive, was the subject of numerous public meetings and City Council sessions before the plans were finalized. With the first two phases of the reconstruction effort completed, the street has reopened from Iowa Avenue west past Broadway, allowing the public an opportunity to see and experience the enhancements envisioned and created to spur interest in the downtown area. It may take some time for citizens to become used to the change but they will come to appreciate the changes and the enhancements. The final two phases will see Mississippi Drive reconstructed to Mulberry, a round-about installed at the 2nd and Mulberry intersection, and 2nd Street reconstruction to the intersection with Iowa 92 at the Norbert F. Becky Bridge. Yet to come are the 2018 public meetings on the design of the Carver Corner intersection and shape of the Grandview Avenue Corridor.